Green frogs in the suburbs are seeing a gender revolution. A new Yale study shows that estrogen in suburban yards is changing the ratio of male and female green frogs at nearby ponds. Higher levels of estrogen in areas where there are shrubs, vegetable gardens, and manicured lawns are disrupting frogs' endocrine systems, according to the study. That, in turn, is driving up the number of female frogs and lowering the number of male frogs. 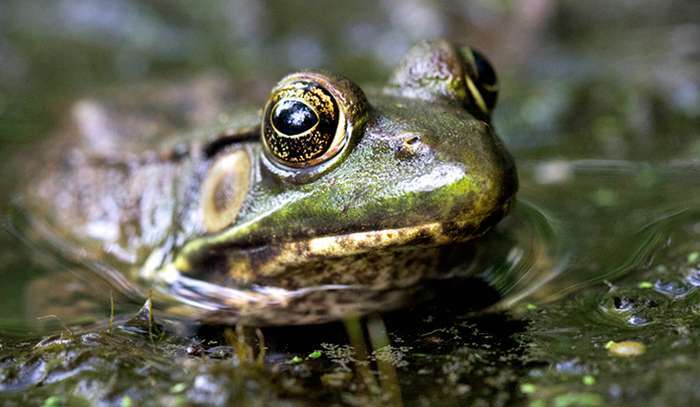 "In suburban ponds, the proportion of females born was almost twice that of frog populations in forested ponds," said lead author Max Lambert, a doctoral student at the Yale School of Forestry & Environmental Studies. "The fact that we saw such clear evidence was astonishing." "Our work shows that, for a frog, the suburbs are very similar to farms and sewage treatment plants," Lambert said. "Our study didn't look at the possible causes of this, partly because the potential relationship between lawns or ornamental plantings and endocrine disruption was unexpected." "Some of our lab's current work is trying to understand how the suburbs influence sexual development in other species," Lambert said.